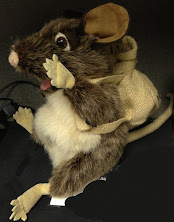 Kentucky Packrat: I'm not dead. I feel happy ... I feel happy.... <thump>. Grad school hasn't killed me yet, but it is close. I'm dreading the numerical analysis class homework coming either Wednesday or Friday, and I STILL haven't had enough time to just sit down and memorize the Hebrew alphabet yet. Plus, let's not forget that full-time system administrator job. The Packrat household is working on generating better habits. The little wonders are adjusting (unhappily) to a 9PM bedtime, I'm working on getting up at 5:30AM - 6AM consistently, and Milady is dealing with my extra hour a day gone. Homeschool is now consistently taking from 8AM to 2PM, so there's more time in our lives consumed. Even so, it's goes pretty well unless someone asks us to do something else, but we're having to learn to say no. I'm trying to make the habit of a 6AM Bible Study time, so if anyone can suggest a good One Year Bible study or a Prophetic Verses daily study, I'd appreciate it. I'm also hoping I can use my Hebrew classes to grow closer to the Old Testament (especially the Prophets, where I always bog down). Then, once I get those habits going better, I should be in better connection with the Holy Spirit to start writing again. I am not going to write much about politics or current events. Politics (and especially talk radio and 24 hour news) darkens my soul too much, and until the Lord helps me understand why, I am staying away. As for current events, I have my opinions, and I'm not sure they're much better than anyone elses'. Plus, all my Blog List authors to the right are better political writers than I am. Instead, I'd like to write "Daily Bread" style short essays about various topics. I've tried this before, but I never seem to keep myself fed enough in the word to write well. I'm hoping to counter this. For those brave souls still reading me, is this something that you'd read? While I want to praise the Lord, if I'm just a clanging cymbol that no one will read, then it's useless and I'll figure out something else to do.